Where to Find European-Asian Pastries in Manila? Why does Korean opt for a French name instead of sticking to a brand name close to Korean invasion where popularity invades the mainstream? It's the same question I've been seeking explanation. I have 5 theories to share. 1. Owners could have been a couple from both continents. 2. The Korean owner learns culinary skills from Europe (the best training they can get). 3. The owner has a weakness for anything French. 4. Koreans are sick of the Korean spelled name and French sounds classy and cool. 5. Korean owner wanted to be different from its peers. Those were just 5 reasons but I still have 5 more. Merely a theories (not my nature to stalk on people). If you have answers heard from the grapevine, comment down. We love to hear from you. Tous Les Jours is a French term meaning "everyday". Pronounced as "Tu-le-juru". Everyday the bakeshop serves its consumers with freshly baked bread, cakes and pastries. At the end of the day, excess products (bread) are sold for a discounted price of 50% off. The same method French Baker and other local franchise bakeshop applied when the stores is about to close within an hour. Aside from adorable and yummy cakes, Tous Lea Jours captured its audience with to die for Macaron de Paris popularly known as French Macaron. With a crisp egg shell crust from outside and chewy, creamy (meringue type) inside, sweet tooth will surely enjoy the little cuddly macarons. From the five flavors available, Foodamn Philippines like most the Green Tea and Chocolate. The other three are strawberry, vanilla and mango. 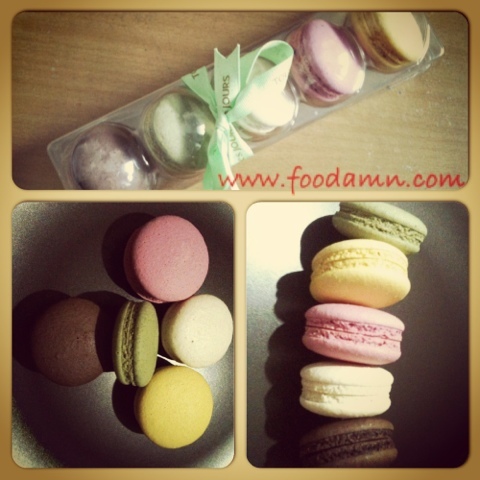 Macaron de Paris (PhP 28 per piece), the stuff is quiet sweet and tempting. Assorted Danish pasties topped with fruits and corn cream bread are also a must try. As for the other bread and pastries, a day is not enough even a week to satisfy this Korean spot. It made me think Filipinos can do better than its counterpart. In fact Filipinos love for food makes us unique and adored by others, we even have world class chefs. With the right training, passion, edgy and creative minds and economic drive, Tous Les Jours' concept with a Filipino twist and rich imagination is doable. With a hint of Filipino exotic and truly Filipino foods made for your visual appetites. Originally created by Green Dei of Foodamn Philippines and Green Dei media PH.